With TVs getting thinner and thinner, most of us have had to resort to either home theater systems or soundbars. However, not all of us can afford the over-1000, high-end soundbars out there. If you happen to be under a tight budget but still want a bit more quality than that of your TV speakers, we have compiled the best soundbar under 100 list for you! The best soundbar doesn’t have to be the most expensive. I wouldn’t expect to have the deepest bass or cinematic 3D surround sound with soundbars that cost under 100. However, the ones we have picked as the Top 10 will certainly give you value for money. They will definitely produce better quality so that you get to enjoy that movie, or music, much more. You don’t become the leading soundbar brand in America by chance. Over the years, VIZIO has been making the best soundbars out there, catering to all classes in society. You’d think that producing budget to high-end products requires so much sophistication. On the contrary, VIZIO believes in keeping it simple. 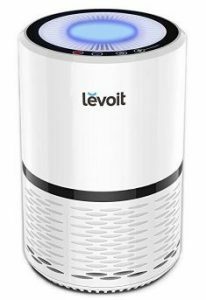 The company employs smarter decisions, innovation, and technology to produce appliances that give its customers the ultimate value for money. So, there is no way that they could overlook this category. Our top pick for the best soundbar under 100 is the VIZIO SB3220n-F6, the immediate successor of the popular VIZIO SB2920-C6. Not only is it affordable, its features and design definitely make this soundbar stand out from the rest in this class. First, the sound is amazing. You get up to 97dB of crystal-clear, room-filling sound with minimal distortion (less than one percent). Its 2.0 Channel premium audio is boosted by two full-range stereo speakers. Also, this soundbar features DTS TruSurround and DTS TruVolume for virtual surround a comfortable volume level. Unlike its predecessor, this model also has the DTS Virtual:X which delivers virtual overhead sound. This takes your entertainment to the next level with an immersive sound experience. It also has Dolby Audio for a rich, clear and powerful audio. Apart from being easy to set up, the SB3220n-F6 also provides convenience by way of Bluetooth. You can use it to stream music from any of your Bluetooth-enabled devices. These include smartphones, tablets, and PCs. A leek design will also complement your efforts to have a welcoming living room. Click here to see how much the VIZIO SB3220n-F6 costs. TaoTronics is another company that is among the leading soundbar manufacturers. So, expect this soundbar to be in line with the company’s quality standards despite the low price. Apart from the audio quality, its compact design allows you to have fun even in a small apartment. The bar is just 34 inches long. In terms of sound quality, you will surely get a better output than from your TV speakers. Compared to its predecessor, the TaoTronics Sound Bar 25-inch, it has more bass and better overall sound quality. Convenience is another factor that attracted us to this TaoTronics soundbar. An extended remote control distance of 11 meters allows you to control the volume and select tracks at the comfort of your couch. You can also use its Touch Mode for control. Setup is a walk in the park. The soundbar can be wall-mounted or set it flat in front of your TV. Also, the soundbar can be connected to other devices wirelessly via Bluetooth, or using the optical, coaxial, and RCA AUX inputs. Click here to see the current price of this TaoTronics soundbar. Not your usual household name, but LuguLake has been producing products ranging from turntables, Bluetooth speakers to soundbars. The company aims to provide customer satisfaction with moderation and simplicity. A testament to that fact is one of our top picks for the best soundbars under 100 category. The LuguLake Bluetooth TV Soundbar Speaker System is not only easy on your pockets, but it also provides quality, clear sound. You get a soundbar that is quite flexible. By a simple twist, you can split the soundbar into 2 satellite speakers and place them at your preferred spot. You can then reattach the two if you want to switch back to the soundbar look. Also, the speaker system comes with a subwoofer in a wooden cabinet. This ensures that you get room-filling audio accompanied by a deep bass. If you need to decorate your room, you can turn on LED lights and set them to different colors depending on the mood, or the kind of visitors you have. The options available are light blue, dark blue, green, pink, and red. Simply turn the LED lights off if you don’t need them on. Another soundbar that deserves a place in your living room despite not being from the biggest brand out there is the MEGACRA soundbar. The audio quality vis-à-vis its price will definitely give you a bang for your buck. This 38-inch 2.0 Channel soundbar has 6 high-quality speakers as well as two bass reflex tubes. Therefore, you get room-filling, crystal clear audio so that you can enjoy movies, music, and TV to the maximum. Also, you can easily adjust bass and treble as required by pressing the Bass+ or Bass- buttons. If you have music on your smartphone, tablet or PC, you can simply stream it via Bluetooth. You can also connect to other devices using optical, coaxial or RCA cables. A USB port also allows you to listen to music stored on your flash drive. To see the current price of the MEGACRA Soundbar, click here. We had to include a soundbase in this list for those who prefer them to soundbars. In case you are not aware of what the difference is, it’s very simple. Soundbars are actually “bars” that you place in front of the TV, or mount on the wall just below the TV. On the other hand, a soundbase acts as a pedestal on which you place your TV. Unlike soundbars, they usually don’t come with separate subwoofers. Back to our best soundbase under 100 pick – the Pyle TV Soundbar Soundbase. With this soundbase, you not only get bass but also crisp, high-quality sound. This is thanks to a subwoofer mounted at the bottom of the soundbase, as well as 4 full-range speakers. If you have music on your devices such as smartphones, tablets or even a laptop, you can listen through the soundbase. This is all thanks to wireless streaming via Bluetooth. Also, a handy remote control helps you control Bluetooth, adjust volumes and select inputs from anywhere in the room. Lastly, please note that since this acts as a base on which you will place your TV, you need to check the respective weight. This soundbase can support a maximum of 110 pounds. So, you need to ensure that your TV weighs less before buying. Max TV weight it can support: 110 lbs. Click here to find out the latest price of Pyle PSBV600BT. Apart from the VIZIO SB3220n-F6 reviewed as the top pick in this list, another VIZIO product caught our eye. The VIZIO SB2820n-E0 Soundbar claimed its spot by the kind of quality it produces compared to the price. This soundbar produces 95dB of crystal clear audio that fills the entire room. Also, it has awesome bass, which you engage by pressing the BASS button. To increase or reduce the bass levels, use the Next/Previous button respectively. LED indicators will respond to increase or reduction of bass. It will not necessarily give you cinematic experience, but be sure to get an amazing sound that will ensure that you enjoy music or movies to the max. With Bluetooth, you can stream music from your iPhone, iPad, PC, Android devices or any other Bluetooth-enabled device. Setup is also a walk in the park, so there is no need of hiring a professional. Click here to find out the latest price of this VIZIO Soundbar. The FULOXTECH SoundBar is also another great option in the best soundbar under 100 category. The reason we picked it despite not being from the biggest brand is the audio quality for its modest price of around 70 bucks. With 4 full-range speakers and 2 passive radiators for bass, this 32-Watt, 2.0 Channel soundbar produces a remarkable sound. This ensures that you get the most out of your movies, TV shows and music. If your music is in any Bluetooth device, you can easily stream wirelessly thanks to built-in Bluetooth 4.2. Also, there are two control modes with this soundbar – touch mode using advanced metal controls and a remote control. Setup is also easy, thanks to 3.5mm AUX in, RCA and AV input options. Whether you love listening to music or watching movies, this is another great option if you are on a budget. The features on the AKIXNO Sound bar will definitely top your inbuilt TV speakers. Also, quality ABS, as well as a stainless-steel finish, make the soundbar elegant enough to complement your interior décor. First, the sound produced is amazing for the price. 4 powerful speaker drivers generate up to 40 Watts sound for any device connected to the soundbar. In terms of usability, convenience is paramount. There are two connection options. You can connect to other devices using Bluetooth. Alternatively, you can optical, AUX or RCA for wired connections. It was a bit hard to find a soundbar that costs less than 50 bucks but still does better than TV speakers. Just as we were about to give up, we landed on the HONEST KIN Bluetooth Sound Bar. It does provide great sound that matches the price, honestly (pun intended). 2 quality speakers in the soundbar produce an amazing 80dB sounds that will fill your living room. Also, a unique anti-noise technology ensures that the sound produced is clear. So, you get to enjoy clear, full-range audio as you watch that favorite movie. In terms of connectivity, you can connect to other devices thanks to Bluetooth 4.1. This will allow you to listen to music stored on your phone, tablet or PC. On the other hand, wired connection is made possible by a 3.5mm audio cable. Another interesting feature is an inbuilt lithium battery. This makes the soundbar among the very few ones that are portable. You can move with it to other rooms very easily. The battery lasts up to 7 hours on playback once it is fully charged in 3 to 4 hours. A micro USB charge cable is provided. Its fashionable design also comes in handy in your efforts to make your home look better. Click here to find out its exact price. Finally, we have another great option you can pick if you a looking for a budget soundbar. The Meidong Soundbar is no. 10 on our list, but by no means the least effective. On the contrary, it has amazing features that will be worth every single cent you pay for it. Unfortunately, if you have a TV set that is smaller than 50-inch, this one is not for you. 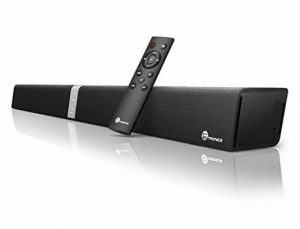 The soundbar is quite large at 43 inches in length. This means that it is most suitable for TVs that are 50 inches or bigger. That being said, you are assured of great quality in terms of clarity and bass. There are 12 speakers in addition to 8 bass boost radiators. The combination ensures that high-quality, crystal clear sound and an outstanding bass. Apart from easy setup, connection to other devices is easy – both wired and wireless. With Bluetooth 4.1, you can stream music from your smartphone, tablet or PC. Also, you can connect it to other devices using RCA, fiber OPT or a 3.5 audio interface. Everyone is entitled to some good old entertainment. Most of the time, you don’t have to spend a fortune to have a better life. All you need is to identify an opportunity that doesn’t cost an arm and a leg but provides some level of satisfaction. And that is exactly what we have done with this review. If you are on a tight budget, any one of these soundbars will help improve on the sound quality from your inbuilt TV speakers. If you have a bigger budget, there are soundbars that cost less than 200 dollars.